Newly redundant and recently divorced, there’s never been a better time for Jessie Henderson to pack up her life in the city and move to Springdale, the small town where she spent childhood summers with her Aunt Bee. Luckily for Jessie, Springdale is every bit as quirky and idyllic as she remembers, and Bee’s baking is just as mouth-watering. Then the unthinkable happens and there’s a murder on the outskirts of town. Worse still, Jessie’s new friend is the prime suspect. The cops think the case is cut-and-dry, but Jessie’s gut tells her there’s more going on than meets the eye. Can she get to the bottom of it? Baking is Murder is the first book in the Bee’s Bakehouse Cozy Mystery series. Each book is a standalone mystery. 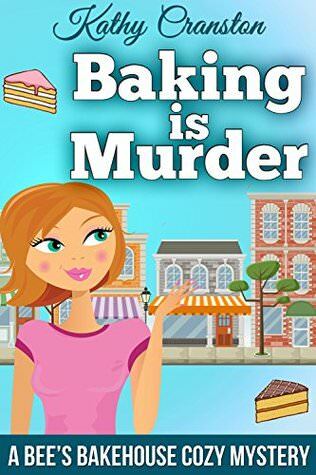 Baking is Murder sounded like a fun and cute cozy mystery and that’s exactly what I got. It’s also surprisingly a very short cozy mystery, I don’t think I have read a shorter cozy mystery before. And while I liked that it was short on the one hand as I was in the mood for a shorter read, but I also felt that it was a bit too short for the story the book wanted to tell. It didn’t feel rushed, but it did feel like things moved very fast, I would almost say it moves a bit too fast paced for what I expect from a cozy mystery as they are usually slower paced. Which isn’t bad in and of itself, but I felt like there were a few things I would’ve liked to see expanded on a bit. Like the search for who the murderer was and getting to know the town and the characters. The mystery is quite straightforward. A murder is committed and someone gets arrested, but main character Jessie doesn’t believe the person who got arrested is the murderer even though the evidence points to her direction. I though it was a tad strange how Jessie had just arrived into town and already decided this women she hardly knew wasn’t a murderer based on nothing and I did like some doubt crept in later as I felt that was realistic. Who was the murderer didn’t come as much of a surprise, but I did consider other suspects for a bit as well and I thought for a second the story would go into an interesting direction and was sad and happy it didn’t at the same time. Most of the plot focuses on Jessie trying to prove the women they arrested was not the murderer instead of finding the actual murderer, which was a nice approach, but it felt like finding the murderer came a bit as an afterthought and the resolution got wrapped up a bit too fast. The only mystery is caused by how we don’t get to know Jessie her completely thoughts when she goes to confront someone. We don’t get a motive or anything much else about the murderer, she just figured it out and it got solved. And that’s where the book end with a short wrap up chapter after that. I also thought the police seemed a bit dump in this book, yes it’s a small town and they don’t get many murder cases out there, but the things Jessie came up with where quite simple and I would’ve thought the police would’ve thought of that themselves as well. I did like how Jessie her relationship with the police was handled, it felt sort of natural, although Jessie was a bit too pushy and jumped to conclusions a bit quickly. With the fast pace of this book and the main focus on the murder mystery I felt like there was little time to really get a feel for the characters, which is a shame. I never really cared about any of the characters. The book is very story focused and we get to know a few things about the main character and some side characters, but they never really felt alive. I wouldn’t liked to get a more feel for the small town, the bakehouse and the characters. we get the basics of Jessie her past and reason why she moved her and I liked how she cared about the dogs, but I just felt it could’ve used a bit more. I never quite got a good feel for her character. There is a set-up for a potential romance, but it doesn’t really go much further than a small hint in this book. To summarize: this was a quick and fun read. The book strongly focuses on the plot and the murder mystery and moves forward pretty straight forwardly. I did enjoy reading the book, but it was quite short and I felt like some scenes or plot lines could’ve been expanded a bit more. I also felt like we got to know very little about the characters and I would’ve liked to get to know them better and a get a better feel of the town. Most of the focus was on why someone wasn’t the murderer and less so on who was the murderer and the why and how. Overall it was a nice start of the series and I kinda liked the short length, even though it also caused some of the issues I had with this book, as it was a quick read and that was exactly what I was in the mood for. Tell me about the latest short book you read? Keionda @Keionda Hearts Books recently posted…What’s YOUR Fav Social Media Site? It was a fun read, but I just wanted a bit more depth. It was unique that it was a short mystery read as I haven’t read many of those so far, but it did mean there was little time to really develop some of the plot lines or get to know the characters. I don’t know the last really short book I read, but I get what you mean. Some stories just need MORE and it sounds like this is one of those. I appreciate your honest thoughts though. It was still a fun short read, but yes it just needed a bit more of everything. I’m very much a character driven reader, so I completely understand that if you didn’t really care about the characters it is hard to enjoy the story. I’m glad you still enjoyed it anyway. I can still enjoy a book if I don’t like the main character, but it sure makes it harder to enjoy the book. I did enjoy it, but I would’ve liked some more depth and getting to know the characters. Lola recently posted…Lola’s Ramblings: What do you think of Trigger Warnings? I can’t really think of the last short book I read. Sorry this one didn’t work well for you. It does sound like a cute story though. It was a cute and fun read, but I just had hoped some things would’ve gotten a bit more developed. I totally get what you’re saying. Sometimes I’m just in the mood for something short, but at the same time, I still kind of never feel like it’s enough to fully develop the story. And don’t you just hate that when the cops in books are just kind of really incompetent? Really when anyone who’s supposed to be a professional as a cop or a doctor or something that took significant schooling or training can’t figure out what a random person does or is tricked by a teenager or something equally incompetent, it bothers me. But anyway, as you said, sometimes something fun, short, and straightforward is what you’re in the mood for, so it works for that. Yes exactly! It fit my mood as I wanted something short, but at the same time it didn’t feel enough to fully bring the story alive. And incompetent cops can really bother me in cozies. I get they need a reason for the main character to get involved, but it’s just frustrating when the cops seem too dump. Like you said they took years of training for this, at least make it believable.